Nollywood actor Ghenga Akintunde who died on January, 3rd just three days into the new year will be buried on the 15th. According to his burial arrangement, Gbenga who died of malaria will be laid to rest at Atan cemetery, Yaba. 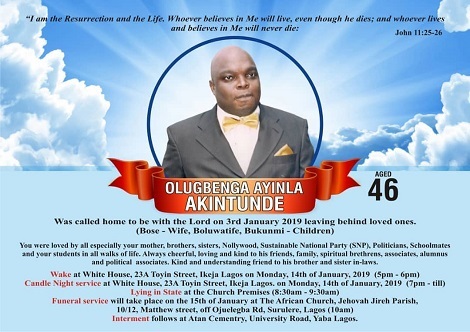 His wake keep will hold at white house, Toyin street, on the 14th, a day before his burial. May his soul rest in peace. Next 13 Year-Old Accidentally Shoots Self In The Face With Dad’s Gun While Taking Selfie, But Survives!